Grammar Giggle – Spacing. It’s Important! Comments Off on Grammar Giggle – Spacing. It’s Important! A reader sent this to me. 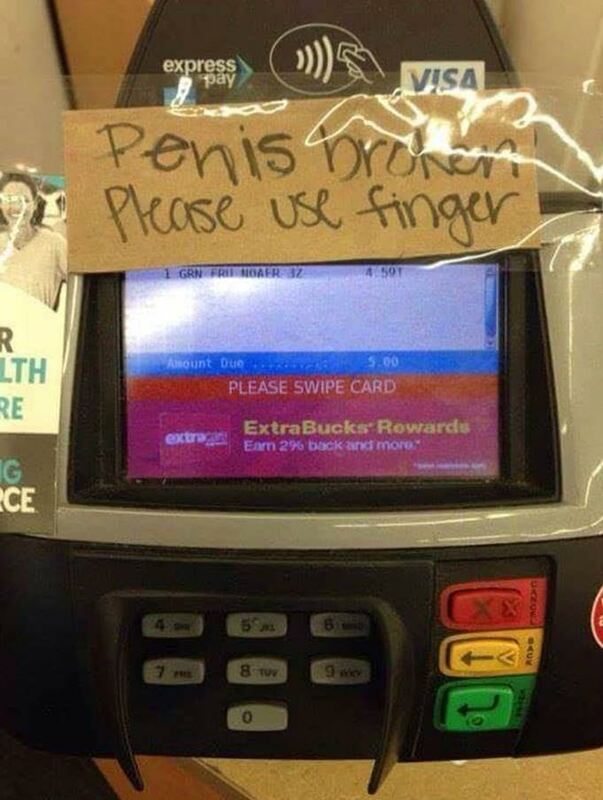 So many things could be said, but suffice it to say that spacing is indeed important. It reminds me of my favorite typing issue. Every time I try to speedily type “does not,” it comes out “doe snot.” Spelled correctly but obviously not what I want to say. Every. Single. Time. So slow down and get it right! Time for a few quickies. Is Internet Capitalized? I’ve seen it both ways, but Associated Press and the Chicago Manual of Style say that the Internet, as “one big specific network that people visit,” should be capitalized. The Gregg Reference Manual says the capitalized Internet is the “global system of linked computer networks,” while the lowercased internet refers to local area networks linked to each other but not to the Internet. So they all agree that when you are talking about the Internet that is more than linked local area networks, capitalize it. What About the Web and Website? The Web is short for the World Wide Web, again a specific thing, so Web would be capitalized–at least for Associated Press. The Chicago Manual of Style disagrees and recently said that the word web standing alone may be lowercased. However, website is a more generic term that can refer to any number of different sites, so it is not capitalized. Just to keep things really confusing, the Gregg Reference Manual says that Web site is commonly two words with Web capitalized and until the World Wide Web loses its capitalization through popular usage, Web site should be capitalized. Since I’m primarily a Gregg user, I guess I will use Web site. Compound words that include web (such as webcam and webinar) are not capitalized. How Many Spaces After a Colon? Again, back in the old days, there were always two spaces after a colon. Now that we are using more proportional type and using only one space after a period, one space is more appropriate. When is Next Wednesday? Since people understand different words different ways, it is always confusing to use the term next Wednesday. Does that mean the next Wednesday after today or the Wednesday in the next week? As it is so confusing, best practice is not to use next in this context, but to be more specific about what day you are actually talking about. Instead of next Wednesday, it is more clear to say Wednesday, February 13, or Wednesday a week from tomorrow. Hint for Possessives. As you may know, misuse of apostrophes to make plural words possessive is my biggest pet peeve. I will admit that sometimes I have issues figuring it out–particularly when the base word is a bit unusual. In those cases, I substitute the problem word for a more generic word. For example, if I’m trying to decide if the name Andrews is plural, I might substitute Smith. So in the sentence I knew the Andrews car was in the neighborhood by the rumble of the stereo, I substitute Andrews with Smith, and I know that the Smith car would not be possessive, so my sentence is fine the way it is. If my example was I knew Mr. Andrews’ car was in the neighborhood . . . and I replaced it with I knew Mr. Smith’s car was in the neighborhood . . . I know that it should be possessive. Make your substitute word something simple to make possessive and it will help you make your word correct. If you have a quickie question or a tip that helps you remember a grammar rule, send it to me (proofthatblog@gmail.com) and we’ll answer it for you and others who probably have the same questions or share your tip so that we can all learn something. Your sentence ends and then what? One space or two? When I learned typing way back in the day it was always two spaces. Apparently, somewhere along the way, the experts forgot to tell me that it changed. The typewriter I used back then was monospaced type (although it WAS electric!). Even with the advent of the IBM Selectric Executive proportional type, it was still double space after the ending punctuation. Now with computer fonts that are nearly all proportional, a single space is preferred. It is a typographer rule that has been in place since the early 20th Century in Europe and in place with American typographers not long after. It is not only the typographers, but also the major style guides (including the Gregg Reference Manual), who use the one space rule. It is important to use correct rules pursuant to your chosen style guide and to stick to those rules, but it is more important to be consistent. If your writer prefers two spaces, use two spaces and be consistent. If they don’t really care (and other than the micromanager, it really shouldn’t matter that much), use one space and be consistent with that. Using only one space is a huge learning curve (or maybe just for me). In fact, in preparation of this post, I had to go back every single time and change the two spaces after every end punctuation to one space. It’s hard to let go of things learned over 40 years ago, but it is not impossible. I’m going to spend this week making a concerted effort to use the correct one space rule rather than two spaces. Who’s in?